I know that the Infected Bounties aren't necessarily meant for high-level players, but seeing how many people don't believe (or say they don't) in the 'increased Quality Loot chances with Manual missions,' and taking into account the fact that the Island can only be run once per day, IBs are one of the few instances I actually 'play' the game anymore. This thread is about that wonderful button that comes up after you collect your Infected Bounty reward. My last Bounty netted me 5 Painkiller, 3 Painkiller, 10 Grenades and a blue armor. Before that it was Burn Dressings and a Manning. Grenades (of which I have hundreds), Meds (of which I have thousands), Premium Weapons (which you practically have to threaten people to even get them to look at). Yes, the IBs are not for everyone, but couldn't something be done to make them remotely worthwhile? Maybe a minimum Fuel prize when you're over level 40? A set amount of Fuel per Bounty similar to our Survivor Requests? Anything to make the IBs seem like less of a slap in the face. I agree. I enjoy doing them, but some of the "rewards" really are a slap in the face sometimes (especially if you have to run 15+ places to kill 5 Herc). A blue that I always recycle and meds/active gear that I have tons of can really make the time spent seem worthless. I'm a new player (2 months), so I still like the premium gear/clothes, but I'm starting to get duplicates. Fuel, upgrade tokens, "good" books, etc would really be great. You get infamous components sometimes, fuel, the occasional keycard. Best I ever got was 125 fuel + keycard which netted me another 300 fuel. Do you really want to click 'Great'? Edited by crazyeightyfive, 03 August 2015 - 03:42 PM. Whenever I finish an Infected Bounty and see my "reward," I always find myself wondering just why I'm doing them anymore. If I wanted to get screwed with rewards, there's always the Island Raid. But seriously, having one of those item slots within a Bounty Crate guarantee an amount of fuel would at least soften the blow when you get 3 ammo caches/meds/nades/Bandit Masks. I am a guy who wants to play everything to full potential. Whatever will benefit my play, i will invest effort considering i got the time to do it cause of my job. But even i dont do IBs for months now. Also a lot of seasoned players dont bother with it either. Guess its just for newbs and we have to accept it. Asking for more rewards is always a problem. It would be nice to get a random boost, similar to the War Rewards boxes. I'd be all for Bounty boxes containing only 3 items and a boost. Make the boosts PVE-related, such as increased damage to infected, increased XP, or even increased droprate on resources (like the insanely- low water droprate, which still hasn't been adjusted, or even discussed by Con). The boosts shouldn't be gamebreaking, but they should be enough incentive to not feel cheated after spending well over an hour to kill 90 walkers per area on an Infected Bounty. 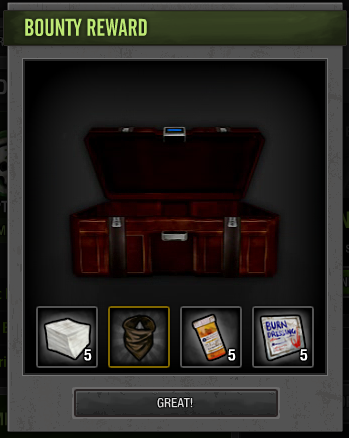 Since the island update came out, the best bounty reward for me has been Grade 5 bandages, of which I never seem to have enough. That's reason enough for me to keep doing them. I agree with the state of the infected bounty rewards likw getting the same terrible rewards like in each slots again . this needs to be fixed I have managed to get the bounty mask "Hunter". Any slot has a small chance of becoming a key, max one key per box. Though it would be interesting to see how each slot is actually generated. All I know, is I'm sick of getting 3 burn dressings per crate. Infected bounties are far to easy for Slot 4 to work like you propose. Unless the odds were such that it was 80-90% you get a common piece of clothing like a baseball cap etc. I thought that would go without saying that the fourth slot would mostly drop common hats or small amounts of fuel. Basically how it does now. The only difference would be that you are guaranteed to get something worth doing the bounty for, as opposed to an ammo crate, 5 grenades, 3 burn dressing, and 5 more burn dressings. Granted, there are those non-DMU players who appreciate ammo crates and nades. But nobody is happy with burn dressings. Nobody. Totally agree,im getting tons of bandit masks i dont use,and this when i get one of the ´´good´´ boxes.There are days when i get most meds and grenades.I know were not losing anything with the Bounties,given theyre part of the missions we run,but seriously,having to say ´´how fortunate i am´´ with that ´´great´´ button sounds more like a satire given most prizes are really not worth the effort. Agreed. Text should be changed to read 'OK'. Just saw this myself - very nice Con and Co. - thank you for listening to our cries. finnally hope to see some good rewards now.